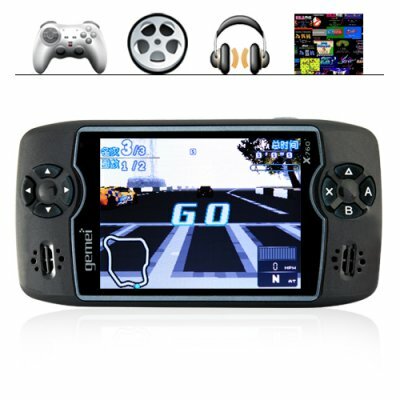 Successfully Added Gemei X760+ Multi Platform Portable Gaming Entertainment System to your Shopping Cart. The Gemei X760+ multi-platform handheld gaming entertainment station with 4 gigabytes of internal memory is now finally available for the export market! This "older brother" of the popular Dingoo A320 is a portable multimedia system that is optimized for the playback of music and video files as well as playing pre-loaded Dingoo 3D gaming files and thousands for ROM's from all your favorite old school gaming systems! Remember all those classic video games from the 80's? Nintendo, Sega, Neo-Geo and Capcom for example? Have you ever wanted to relive that fun? Well, now you can play them again in an easy to use hand held form factor - our CVLK-N08 allows the playing of its own selection of great 3D games along with thousands of classic 8-bit and 16-bit ROM's you can download from the internet. Containing a huge 4GB internal memory, this unit will store so many games it would take you 100 years to play them all! An excellent portable media player in its own right, the number of video and audio formats you can play directly with the Gemei X760+ is simply amazing (18 types! ), making this digital media player way better than the equivalent "name brand" units on the market today for playing MP3 and MP4 type files. Everyone has seen those media players on the marketplace today called "MP5 player", well this one is so good we should be calling it an MP10 player! With a high resolution 3 inch widescreen display, the CVLK-N08 Gemei X760+ Multi Platform Portable Gaming Entertainment System makes all your digital media look as good as it can be while you are on-the-go. While a great wholesale price makes the CVLK-N08 perfect for the resale market, VAR and OEM markets, or simple personal enjoyment :-). In stock in our warehouse right now, order one today and we will express ship it out tomorrow! From the leader in factory-direct electronics - chinavasion.com. TV-OUT for playing on your TV or big screen projector! NOTE: The included instruction manual along with two of the pre-loaded games are in Chinese. Transfer media from your computer directly into the systems 4GB's of memory for quick access or onto an SD card for swapping. The Gemei X760+ uses a standard u-disk style file management system meaning you are in control of how you store and organize your files! Capable of storing thousands of cool videogame ROM's from the most popular 8-bit and 16-bit systems, this ultra-fun device is capable of keeping even the most demanding gamer entertained for the next ten millenniums. We cannot provide direct links, but if you a search for the Dingoo A320 or Gemei X760+ you will find a lot of user forums with loads of useful information.